The contents of the Property Details panel will change depending on whether it is a sale or rental property and which property attributes have been activated by your BDP administrator. Clicking the edit link or pencil icon will allow you to edit the fields in this panel. 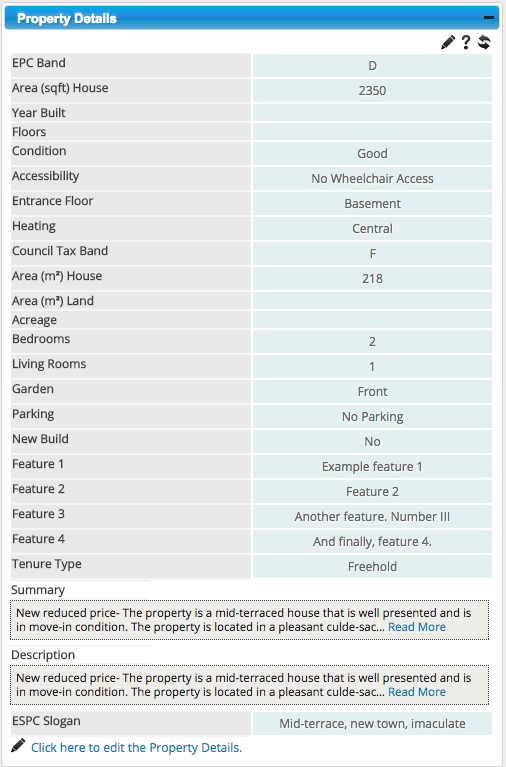 To add a summary or full description to a property, click the input box and a full text input panel will pop up. This will accept only paragraphs, headings, bold and italic text and will strip out all other code. This is to eliminate formatting issues when copying and pasting from Word or other applications. NOTE: Scottish clients. It is mandatory to include the EPC band in all property marketing. You must select the appropriate band from the drop-down list in this widget. If you are a client of the ESPC you will see a field for “ESPC Slogan”. This is a 40-character text field that will appear on the showroom card and in all ESPC printed materials. Click the Save button when finished entering text into the text editor pop-up and click Save again at the bottom of the panel to commit your changes.